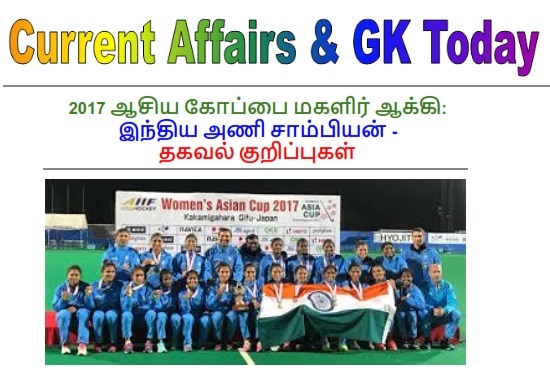 TNPSC Current Affairs and General Knowledge (GK) Today November 6, 2017 Women’s Asia Hockey Cup 2017: India Champion - Notes in Tamil and English PDF. This post covers complete World Tsunami Awareness Day Notes in Tamil and English PDF format for forthcoming TNPSC Combined Group 4 and VAO exam (CCSE 4), TNPSC, TNPSC VAO 2017, TRB, TET, RRB, UPSC, Banking other Competitive Exams. 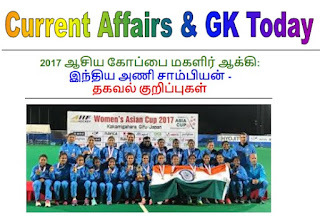 Download this file to PDF format.